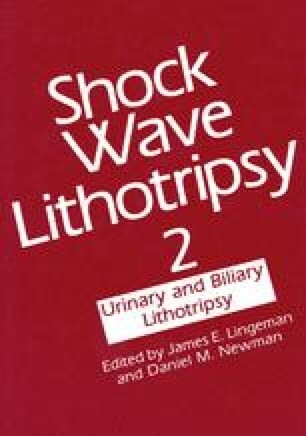 It is now well established that extracorporeal shock wave lithotripsy (ESWL†) produces significant acute renal side effects. There is strong evidence that chronic effects may also accompany ESWL therapy. The clinical and experimental data that document tissue injury from ESWL are compelling but do not adequately address the factors that are responsible for adverse acute side effects or the conditions that may lead to serious long-term health problems. In order to resolve these issues, it is necessary to determine the precise mechanism by which cells are damaged by ESWL. To accomplish this goal, animal experimentation is required so that the time course and severity of acute and chronic alterations can be followed. Animal models allow whole organ analysis of changes in both structural and functional features. These studies must be designed to give the best approximation of the treatment conditions that are applied to patients. To do this requires an animal model with a kidney that has similar structure and function to that of man. The kidneys of most small animals and many large animals, including the dog, do not mimic human renal anatomy and physiology. The laboratory pig appears to be the best large animal subject for ESWL research. The pig offers a model in which kidney size, renal/urinary anatomy, and characteristics of renal function closely resemble the human. Moreover, the methodology for correlative structure and function analysis in the pig is well established. Preliminary data on the mini-pig suggest that it is an excellent model to study the bioeffects of ESWL in that acute traumatic injury, similar to that reported for patients, is induced at therapeutic levels of shock wave delivery.